What is the minimum number of credit hours needed to receive my Bachelor's degree? You need 124-126 credit hours to receive your civil engineering Bachelor's degree. 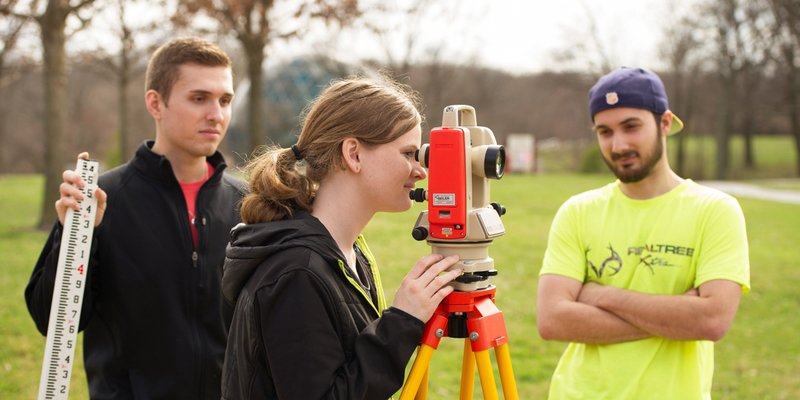 Students interested in any of the majors offered by the School of Engineering should seek advisement from the School of Engineering when they initially enroll at SIUE and should declare a major as soon as possible. Students admitted to programs offered by the School of Engineering shall have met University admission requirements, successfully completed any required academic development and high school deficiency courses, completed MATH 120 - College Algebra (or high school equivalent) with a grade of C or better, and have a cumulative GPA of 2.0 or better in any completed university coursework. Students with high school deficiencies, those with AD (academic development) requirements, and those starting in a mathematics course before MATH 150 - Calculus I, will require more than the eight academic semesters shown in this curriculum guide. Where can I find information about taking the FE exam? The Illinois Society of Professional Engineers website has information to help you learn about licensure in Illinois and how to apply for each step including the Fundamentals of Engineering exam at this link. The lab and classroom computers in the Engineering Building use Microsoft Windows, so students purchasing their own computer should keep in mind that they will likely have fewer problems if their computers use similar systems. Many students in the engineering programs have had good success using Macintosh computers, but you should ensure that whatever system you purchase will have suitable software installed to be compatible with a Windows environment. We generally use Microsoft Office applications Word and Excel for many course related activities (writing papers, tabulating and analyzing lab data, etc. ), so it would be convenient for the student to have these or similar programs to use outside of their classes or labs. Current students can also download and install Office application and use online versions of Office 365 applications. For more information see http://www.siue.edu/its/office365/index.shtml. If the student will want to connect to certain computer resources while on the campus network, particularly the Z drive private storage space residing on the Engineering Building server that is allotted to each engineering student, they will need to use at least the "Pro" version of Windows 7 or later. Many "netbook" type computers cannot use the "Pro" versions. Be sure that the computer you plan to purchase can run the "Pro" version of the operating system. Without the "Pro" version, the computer might still be able to connect to internet sites through the campus network, but it is not guaranteed. Students with a valid school ID can usually purchase academic versions of most commercial software at a significant discount. Some software is available at the campus bookstore and many other vendors also sell academic software versions. Software licensed to the University is only available for students to use on university-owned equipment. The CE department does not require students to purchase any software, nor does it normally provide software to students to install on their own computers. Occasionally, a specialized software package useful for a particular class may be made available to students, but the terms of the software license are strictly adhered to. The campus offers two wireless networks. One is considered to be not secure and the other is considered to be secure. For more information about computer support offered by SIUE, please visit Information Technology Services (ITS). What kind of calculator do I need? Students are encouraged to use allowed calculators on the Fundamentals of Engineering exam, which all Civil Engineering (CE) students are strongly urged to take before graduating. The list of allowed calculators can be found on the NCEES website. The CE department does not require any particular calculator to be used. The ones allowed for the FE exam are relatively inexpensive. Students may use more powerful calculators than these for doing homework and taking quizzes and exams. However, any calculator that can also double as a web browser, cell phone or chat client is prohibited for use during quizzes and exams. Who can give me Civil Engineering career advice? Almost all CE faculty have volunteered to be mentors to our students.